The dreaded office carpet, the mysterious land of crumbs and dirt. Have you ever wondered what’s really accumulating beneath your feet? Your carpet is the perfect environment for bacteria, dust mites, fleas and mould to thrive. There’s no quick fix to get rid of the horror’s that live below your feet, but regular care and maintenance can help to prevent them. We have compiled everything you need to know about what’s living in your carpet and how you can prevent them. Do you eat your lunch at your desk? What happens to all those crumbs? That’s right, straight onto the floor! This is a great source of food for bacteria and organisms to thrive. That’s not even the worst part, it’s what they bring with them. The microscopic creatures carry serious health consequences; colds, allergies and potentially cause serious breathing problems in the long run. Pollens can be carried into the office by the soles of your shoes, it’s important to remember to wipe your feet on doormats to prevent this. If you have seasonal allergies this could really affect you. To protect the carpet, you can use rugs and runners. Whilst this may not seem practical in an office but could save you from replacing your carpet too soon. Spill a drink? Clean it up as quickly as possible. The longer you leave it the more it will absorb into your carpet and will be more difficult to remove. The best way to clear up a spillage is to absorb the liquid up with paper towels, mould loves moisture, it’s the perfect environment for them to thrive so make sure you have absorbed every single drop. Just because you can’t see it doesn’t mean it’s not there, pathogens like salmonella and staphylococcus hide in carpet fibres. The average adult sheds 1.5 million skin flakes per 24hours, and the microscopic ticks and mites love to feed on those skin flakes. Vacuuming is a great way to reduce some of the dirt in your carpet but doesn’t quite do the trick. 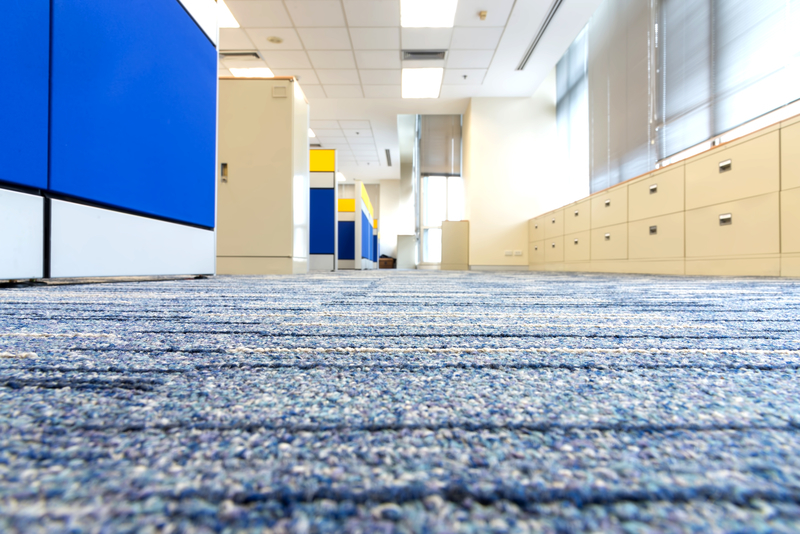 It’s recommended that you deep clean your carpets every 12-18 months, however, because an office has high traffic and is constantly being used, they recommended a deep clean every month. Hiring professional carpet cleaners is a great idea, they know what they are doing and guaranteed to do a good job. When it comes to carpet cleaning, you get what you pay for, we understand that carpet cleaning is expensive, remember you only need to do it twice a year. 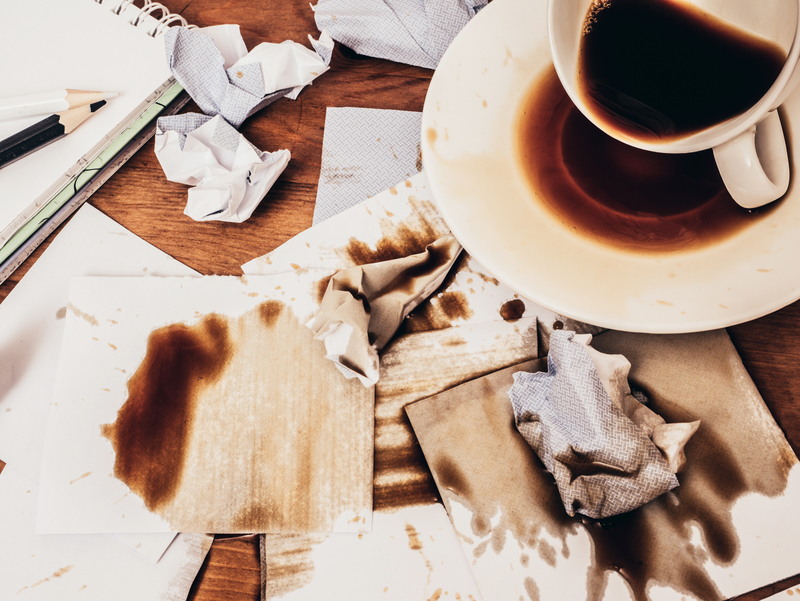 Spilt something and want to clean it up before your boss sees? You can purchase cleaners at your local store to lift those stains. It’s important to remember that you should patch test any chemical before you do anything, if the chemical doesn’t work with your carpet it could cause serious damage. When removing a stain using a clean cloth to remove residue, stick to blotting motions and never rub the stain. Rubbing motions will only push the spillage into the carpet, even more, making it much worse.